On the eve of the feast of the cabal of hypocrites, otherwise referred to as the 2012 NATO Summit, the people of Chicago have undergone a grave injustice at the hands of the violent police state. The Chicago Police's actions today, May 19th, were a brutally violent attack on our bodies and on our rights. An absurdly large police force was deployed in order to intimidate and provoke a peaceable assembly, and resulted in unbridled, militaristic attacks on activists demonstrating against NATO, inflicting several serious injuries - including broken noses, bloodied eyes, and a particularly sickening incident in which a dedicated comrade was belligerently run down by a police van. We vociferously condemn these unacceptable and cowardly attacks, and know that the people are beginning to awaken from the falsified dream of liberty in a nation thats find itself in a newly authoritarian police state which crushes any dissent and defends the war machines of internatonal violence and global capitalism, instead of the human beings it feigns to represent. Yet we will not be so easily fooled by these tactics. The actions by the Chicago Police Department were carried out tonight with the calculated intent of provoking and generating fear within our collective into a reactionary state. This is a police tactic that is used to distract our focus and to spiral us into downwardness and negativity. We must resist these feelings, for we lose our autonomy in reacting to the script they have written for us, and without steadfast descipline in the face of the arm of state repression. We have to be serious and disciplined in order to not fall into this trap. It is EXACTLY what they want from us. We know that this is a panicked attempt to postemptively justify to the people the astronomical amount of our public resources that have been wasted on the exorbitant number of police on the streets, the unlawful and intrusive surveillance & unjustifiable home raids, and the Orwellian fear being propagated by the puppet corporate media. Our organization will not be provoked into a state of disorganized rage, for we are well aware that is exactly as they wish to manipulate us. It is no better, nay, it is worse to fall into their cheap and predictable trap than it is to subserviently subjugate ourselves to obeying the orders of authority. This national convergence represents an incredible and unique opportunity to bring together a diverse spectrum of activists in a unified front of resistance unlike any other seen in over a decade. Tomorrow, we enter the stage with a righteous fire in our hearts at the injustice done to us and our comrades on these streets just a day before. Yet we will not be overriden with heightened emotions that cloud our judgement. We recognize this attempt at coercion as yet another manifestation of systemic oppression, and remain autonomous individuals who will not be ordered around, explictly or implicitly. Instead, we channel our anger, our pain, our compassion, our despair, and our passion for a better world without this oppression into our messaging and our actions. Comrades. Let us take a deep, deep breath together. Let's heal together, and then work together to make tactical decisions that are arrived at out of truly free and autonomous choice, not dictated by authority. Be safe, look out for one another, organize in small, accountable groups of affinity and trust, Stay calm, and remember why we traveled to Chicago - to stand in the face of a war machine that acts recklessly beyond transparency and accountability to the people it affects and claims to represent - and to say we want a world free of war and oppression. Why haven't we seen our politicians denouncing the actions by our gov on innocent protestors. Sometimes I think the system is managing the politicians. They only speak out against that stuff when it's in Egypt. Obvious alternative answer, Occupy is seen by the politicians as a movement involving a small minority. The voting public hasn't gotten behind Occupy to the point where any significant number of votes is involved. As long as a majority of the public sees demonstrators as trouble makers not patriots you won't get political support. In short you have a PR problem. I saw the Cop drive the Van on my tv news last night could not believe my eyes why is the cop driving the van not in jail for attempted murder. I'm 72 i always thought the Cops were good guys with some bad apples here and there. From what I see in Oakland, New York and Chicago maybe more bad apples than good. Disgusting ! "American Spring - Even the cold early spring of 2012 could not deter Occupy Wall Street (OWS) activists in New York city. People from different backgrounds continue to come out onto the streets. The agenda driving all the protesters remains the same: income inequality, corruption among banks and multinational corporations, foreclosures, climate change, police brutality and above all, the need to get together and talk in person – not just via mobile phones. It is all about the courage of ordinary men and women to tell the truth to those who hold power." : http://rt.com/programs/documentary/american-spring-occupy-protests/ . My heart goes out to all you brave people in Chicago. Yes, the people and police putting up with the self-important and destructive hippies. Lol, I think you have that wrong. Who wouldn't want to club one of those loser hippies? The cops could do a fund raiser for time on the water canon or for the previlege of firing the tear gas. I don't have the time now to get in the gutter with you. If you want to look at something out of the gutter, you'll have to go to Chicago to see the "protesters". 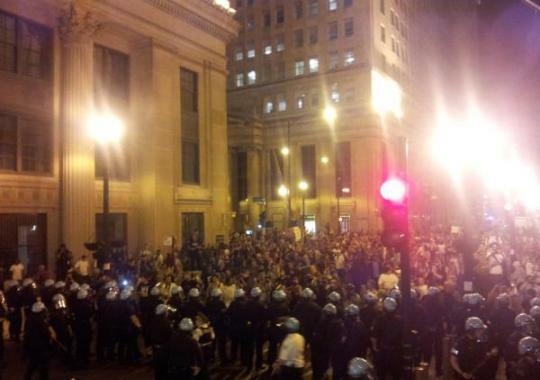 The Chicago police are showing stunning restraint. A good crack on the skull is the best hope those hippie freaks have at a normal life. You are lacking in intelligence and you are childish so i know that you will appreciate this: "If you want to look at something out of the gutter," look in the mirror. People of Chicago you are awesome. Get out in the streets and protest - HELL YES. Keep in the eye of the public. Show how The Powers That Be Are Trying To Deny Free Speech and Legal Protest. Show How Our Rights Are Being Attacked and Denied. But also support those who would support us. As we try to regain Our Government and our Country. Protest in the streets - But do not forget to own our Democratic Process as well. Support OWS and the world. Vote out any and all politicians that do not support the Constitution. Look at voting records - some politicians actually are trying to support the Constitution - The People. Support those who support a stronger EPA. Support those that Support regulation of WallStreet. Support those that support OSTA. Support those that support the repeal of corporate personhood. Support those that support getting money out of politics. Support those that support ending earmarks. Support those that support ending insider trading in government. Support those that support ending subsidies to fossil fuel tobacco and other subsidies like them. Support those who support green power and transportation technology. THIS IS A MULTIPLE FRONT AGAINST GREED CORRUPTION AND CRIME. Why the Hell aren't YOU out in the streets, DKAtoday? If I lived as close to Chicago as you do, that's where I'd be! Damn ... that was beautiful. This sounds like it was written by the Soviet Union about 1970. I'm surprised it doesn't quote Marx or Lenin. I have nothing against the movement but crap like "marching in solidarity with the struggle of the working class comrads" is something straight out of the Comintern. Who the heck writes this way? Widespread support doesn't happen by sounding like you want to overthrow the government. Your words say that you are in favor of peaceful non violence, but the underlying subtext says something entirely different which most people will find revolting. If you want to win the hearts and minds of Joe Sixpack to your cause, sounding like Hugo Chavez on one of his rants won't win you any followers. That language was used all over the world my friend and it's something that has never stopped existing just because joe sixpack has learned the language of consuming instead. The American working class needs to learn revolutionary language instead of expecting the whole world to change around them. Also, widespread support DOES happen by sounding like you want to overthrow the govt. sometimes. Look at North Africa and the middle east. Also, say what you will about Chavez, he also has a lot of support. "And we solemnly declare that we will preserve our liberties being with one mind resolve to die free men rather than to live slaves." Thomas Jefferson, on the Necessity of Taking Up Arms, 1775. Here is intellectual savagery, indefensible -- you guys should give it visibility and clean the system! Boeing has asked there workers to work from home. A small victory of shutting down that 1% corp for a day. Support peaceful protest. Support the 99%. March for your freedom. I am just as angry as the next guy about the many injustices being carried out on the American public by those in power. I fully believe in and embrace the First Amendment. However, I am extremely upset over the actions of protesters whom I originally thought were also peaceful demonstrators. What I witnessed on Sunday has left me feeling so deflated. The OWS mission is being diminished by the actions of a hateful few. The orchestrated lunge at police officers by protesters at the the end of the vets demonstration was nothing more than a flagrant publicity stunt. I was so disgusted by the whole thing. Who organized that little stunt?! I've lived in Chicago my whole life and have nothing but respect for our public servants. The job they do isn't easy and it deserves respect. I have zero tolerance for these folks who are using OWS and events such as NATO as an outlet and vehicle for their hatred and violence. And I definitely don't have any sympathy for whatever actions police took/take against them. As I already said on a previous comment on another article on this site... one thing anyone who lives here knows is that "if you get your raucous on, you're gonna get put down." We've got enough troublemakers here, we don't need anymore. So if you're gonna come into my town with plans of acting like a fool and getting away with it... you've got another thing coming. I don't know what can be done to weed these folks out but something has to be done cause those stupid few, are making the rest of us with the original OWS agenda in mind, look real bad.